The day began with gnomes, a cow, two goats, and hens; a short walk, Mr Bean, and a friendly duck. 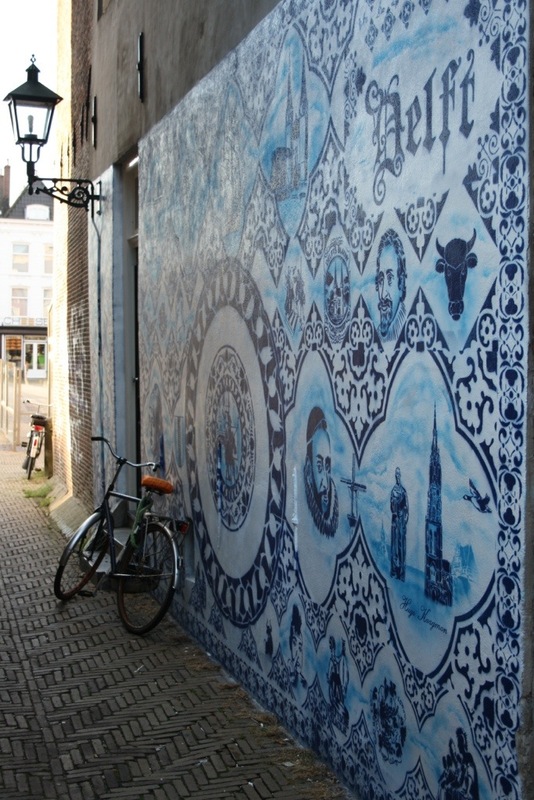 A strange combination, yes, but then Delft is an odd, and yet beautiful, place. After snapping many pictures, we crammed ourselves into Johan’s Jaguar and made our way towards Germany and the incredibly smooth, straight, and more than a little scary, autobahn. Today’s blog post should focus on the ride itself, our short stop in Germany’s answer to Glenrothes, Bremen, and our eventual arrival in Hamburg. I will, however, take a short look back at our trip to Amsterdam. As we sat in our hostel in Hamburg – accommodation that made me feel old surrounded by the young backpackers – we had a look at some pictures of Jane’s paintings. There is one painting that grabbed our attention. 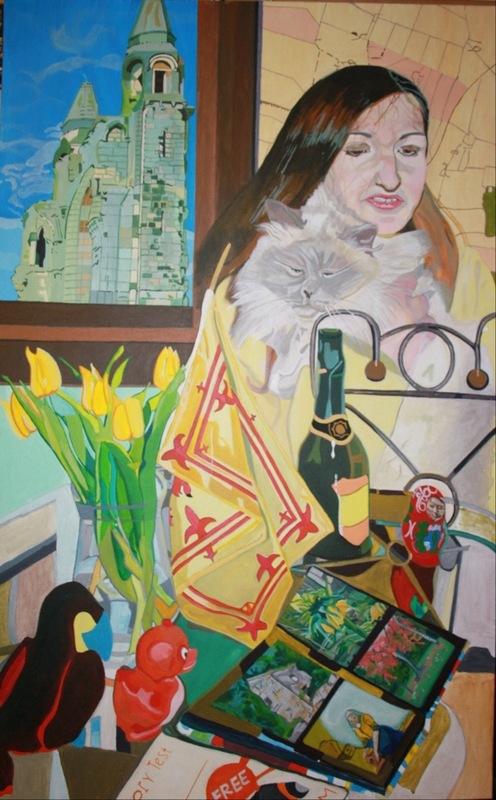 In it, Jane stands behind a table holding her beloved cat, Skye. Dutch tulips sit in a vase beside a Lion Rampant, a nod to the combination of Scottish and Dutch influences. Behind Jane’s right shoulder is a window through which you can see St. Andrews’ Cathedral, and a small photo album lies to the front, each photo with its own story to be told. You may recognise one of the small paintings within a painting, it is “The Milkmaid” by Johannes Vermeer. For me, this painting encapsulates why The Netherlands were important to Jane, and why we had to include this small area of Europe in our journey in her memory. Our stop over in Germany was convenient, being located between The Netherlands and Scandinavia, but it was not integral to our trip since Jane had no connection to this large, powerful country. Even so, I was delighted to get the chance to see some of Hamburg. Like most German cities, it was flattened during the war. The rebuilt city hall is a testament to humanity’s ability to heal and repair. It is, in a way, a metaphor, a physical representation of the conquering of grief: the importance of moving on and contextualising tragic histories. I hope that Journey For Jane will begin a similar process of renewal: a reclamation of Jane’s memory for my family. Hamburg was the last stop for our friend, Johan. We are very grateful to our Flemish friend for showing us the highlights of Flanders and The Netherlands. His contribution to our journey will be long remembered – as will his comfy Jaguar that seemed most at home when flying down the autobahn. We found this sign in Delft and I can’t think of a more fitting tribute, thank you again, Johan.